News flash. 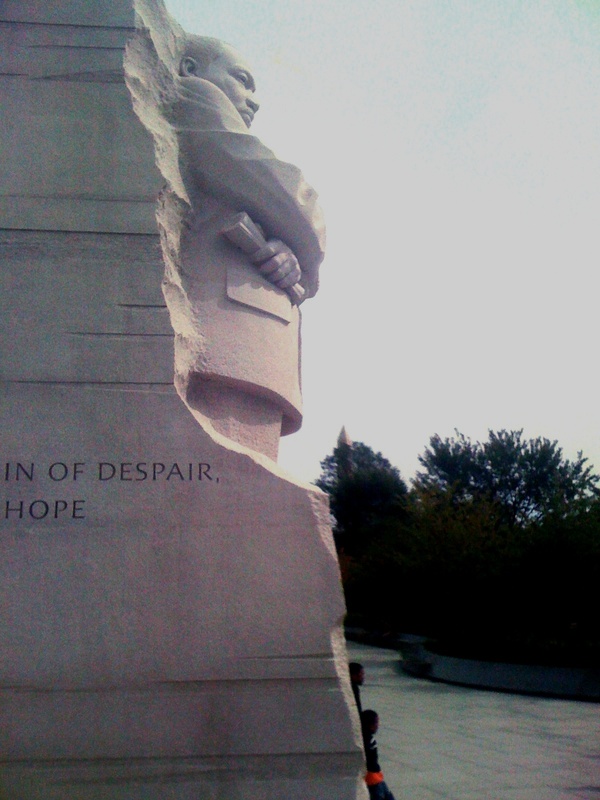 There’s nothing wrong with the Martin Luther King Jr monument on the mall in Washington DC. In fact, there’s a lot that’s right to it. King emerges in a slice of granite, out of a mountain, looking across the Tidal Basin to the Jefferson Memorial. He stands erect, arms crossed with a look of righteous anger. He’s staring out across the water to Jefferson, with a vigilance on our own progress towards living up to the ideals proposed in the Declaration of Independence. King’s body is only partly sculpted, just like the work of extending civil rights and equal opportunities for all remains unfinished. The plaza is replete with quotes from his speeches and letters, reminders to Americans of his life, and the courageous activism throughout his brief 39 years. The view across the water gives the site a serenity and a sacredness broken only by the children enjoying the space to run and to line up for pictures at the base of the monument and next to quotes. The plaza was full of people on the mid-week morning I visited. People of all races and all ages. It’s a short walk from the WWII Memorial and the Lincoln Memorial, a walk also full of people, on their pilgrimage to this site. It’s around the corner from FDR’s memorial, which is more like an outdoor museum, informative, but tucked away, and empty of people. I’m pretty sure that most visitors were not thinking of the controversies surrounding the monument, issues which have been given too much attention. Yes, King looked a little stern and imposing, a little too much like other statues which the Chinese sculptor may have designed for Mao. Yes, there is an edited quote on the statue base, which could have been cited in its fullness on the wall surrounding the statue. It’s not as if King avoided controversy in his lifetime. We caught a glimpse of that with the release of Jackie Kennedy’s tapes with her 1964 comments calling him a “phony” and “terrible.” I doubt too that visitors had those comments on their mind. The monument will endure beyond these little issues, which will undoubtedly fade into obscurity. One hundred years from now, people will continue to pay tribute to King and his ideals. Moreover, his challenge to the nation will, unfortunately, probably also outlast the petty issues that help fill up our instant news cycle. This entry was posted on September 19, 2011, 9:41 pm and is filed under History ahead. You can follow any responses to this entry through RSS 2.0. You can leave a response, or trackback from your own site.